Walt Disney once said, “We keep moving forward, opening new doors, and doing new things, because we’re curious and curiosity keeps leading us down new paths.” So, I’d imagine he’d be pleased to see that the company he founded is heeding his words and heading down a new path. Soon, guests at the Walt Disney World Resort in Orlando will no longer need to keep track of tickets or cards to gain access to the park or rides. Instead, they’ll simply have to don a wearable band. Called MagicBands, the high-tech bracelets are designed to be an all-in-one device that connects park visitors to everything. Using Radio Frequency technology, guests need only tap their band at the various touch points being installed throughout the Walt Disney World Resort to enter the theme parks or their hotel room. They can even be used to buy food and souvenirs. 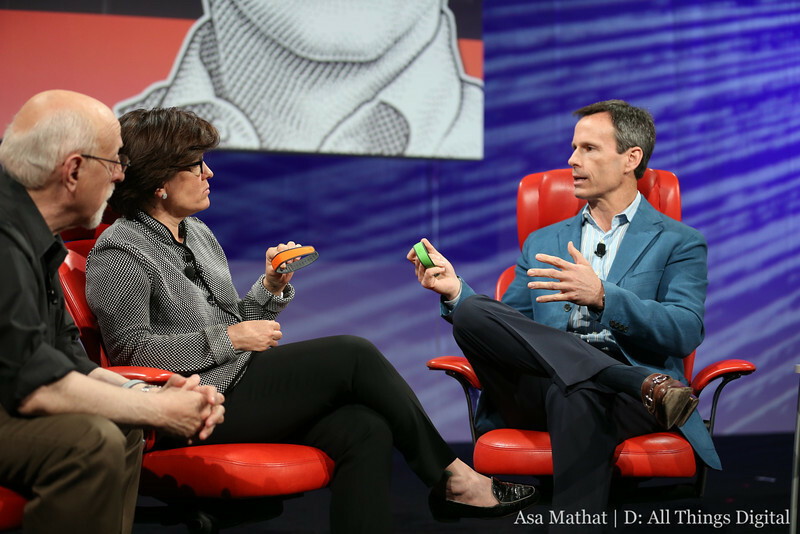 Thomas Staggs, chairman of Walt Disney Parks and Resorts, joined AllThingsD’s Walt Mossberg and Kara Swisher onstage at our D11 conference to demo how the MagicBand works and explain how the company has been using technology to enhance the guest experience. Developed over the past several years, each MagicBand contains an HF Radio Frequency device and transmitter that can send and receive RF signals through a small antenna inside the band. These signals can be read by the new Mickey-themed kiosks that are being installed throughout the Walt Disney World Resort. To give you an example of how it works, right now, to enter the park, you have to walk up to a kiosk, have someone scan your ticket and then go through the turnstiles. If there’s an issue with your ticket, more often than not, you have to get out of line and go over to guest services. With MagicBand, you just have to hold up the band to the touch point and if you get the green light, you’re good to go. If the kiosk happens to shine a blue light, that means more information is needed but an attendant can come and help you right away. Aside from entry into the theme parks and resort hotels, guests will also have the option to connect other services to the device using the revamped My Disney Experience website. This includes FastPass+ reservations (a service that helps reduce the time you wait in line for rides and allows you to reserve seats for fireworks and parade viewing, shows and character greetings) and accessing photos taken by Disney photographers. Given the amount of data that the MagicBand holds, privacy and security are certainly a concern. But Disney said the band doesn’t store any personal information. Rather, it contains a code that securely links to an encrypted database that stores all the data. 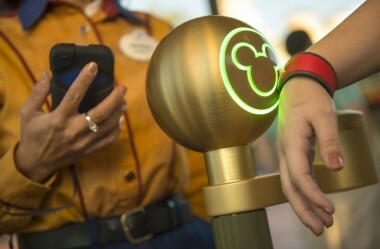 Also, the bands can be disabled if lost or stolen, and if you connected a credit card to the MagicBand, a PIN code is required to finalize any purchases. Parents can also place restrictions on their kids’ MagicBands to disable the ability to purchase items or limit the amount of spending. Disney has been testing the MagicBand with employees and a limited number of guests for about two years, and the band is just one element of a new guest experience called MyMagic+. It also includes the updated My Disney Experience website and mobile app, which allows you to plan various parts of your trip, make and change restaurant recommendations and coordinate plans with friends and family, among other things. Realizing that more of their guests were arriving with smartphones and tablets in hand and expecting access to more information, Disney started the MyMagic+ initiative a few years ago. The overarching goal of MyMagic+ is to provide a much more personalized vacation, even down to characters knowing your name. Staggs gave the example of a little girl being greeted by one of the Disney princesses by first name. But he reiterated that many of these personalized features are all opt-in services for those worried about this Big Brother-type behavior. Staggs said in the future the MagicBand could have a screen or potentially tie into other Disney experiences, like video games and movies. Despite all the tech behind the MagicBand and MyMagic+, Disney actually wants to hide that aspect of it. 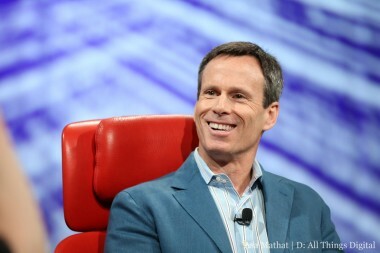 When asked how technological Disney should get, Staggs said, “I don’t think there’s a limit. I think that tech for its own sake in our park should not happen … It’s not about the technology. It’s about the magic that it creates. The place, the mood, and the time.” The company’s goal is to have its visitors leave thinking, “Wow, that was incredible,” and to feel like they were part of the Disney story. Disney plans to launch MagicBands at Walt Disney World later this year. All visitors who stay in one of the Disney Resort hotels will get a band, while others can purchase one with their park ticket or opt for an RFID-enabled card with similar features (resort guests can also choose the card if they don’t want to wear the band). Though launching at the Orlando-based resort first, the goal is to roll out some version of MagicBand and MyMagic+ to all the Disney parks around the world.